"I've never seen anything like that before." Powwow dancers take to the floor in Edmonton, in a powerful tribute to missing and murdered Indigenous women and girls. Michelle McCauley has attended a lot of powwows in her lifetime, but says she's never laid eyes on something so powerful as what she witnessed this weekend. McCauley, a member of the Pyramid Lake Piatue Tribe in Nevada, made the 21-hour drive to Edmonton to attend the National Indigenous Cultural Expo over the weekend. On Sunday, a competition powwow was held to wrap up the event, with representatives from tribes across North America dressed in full regalia, dancing to win cash prizes. But before the dancers took to the stage, organizers brought out a red dress, created by an Indigenous designer, hung high on a pole. Indigenous men formed a circle around a red dress, meant to symbolize missing and murdered Indigenous women across Canada and the U.S. 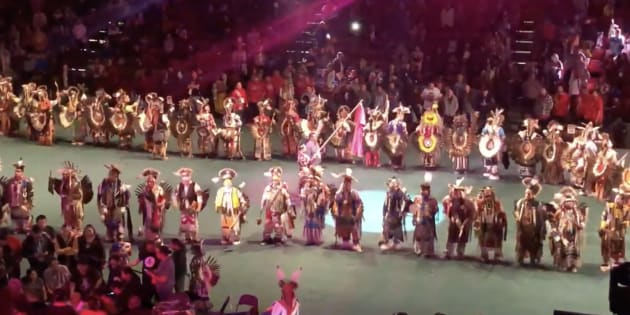 They then asked the male dancers to come onto the arena floor and form a circle around the woman holding the red dress — which is used as a symbol for missing and murdered Indigenous women and girls (MMIWG) in Canada — and close the gaps between them. Then the men began to dance. McCauley says she was floored. "To see that many men circling around a woman, I've never seen anything like that before," she told HuffPost Canada. "It was so powerful." McCauley captured the moment on video and posted it on her Facebook page, where it's been shared more than 4,000 times. "The video really resonates with people because it shows men finally being able to take their place as protectors," she said, explaining that trauma caused by residential schools and forced colonization has destroyed so much of what is culturally important to Indigenous people, including the ability for men to serve as protectors for their families and communities. "So many of our Native women are standing up for each other, supporting each other, but we're not seeing it as much from Native men...so this symbolizes men finally taking their place," she added. Even though McCauley is from the U.S., she says she's been closely following the issue of Indigenous women in Canada who have been murdered or gone missing — so much so, she said, that she will not stop in any small towns in Canada while on her drive back to Nevada. "The people who have murdered these women are either getting out (of prison), or not prosecuted, or they're not even found at all. It's an epidemic." According to the National Inquiry into MMIWG there are more than 1,000 cases of missing and/or murdered Indigenous women and girls in Canada, with many more cases unreported.